Verdegaia is based in Vigo, Galicia’s largest city. In late 2017, a catastrophic wave of forest fires desolated Galicia and Portugal, killing over 120 people and burning over half a million hectares. The “Brigadas deseucaliptizadoras” (or “De-eucalyptization Brigades”) is a grass-roots, environmental activism project that emerged after this. Eucalyptus is a highly invasive and pyrophile species that has been encouraged for decades by the pulp industry. Eucalyptus monocultures create a “green desert” with extremely reduced biodiversity, pushing back native forests to small fragmented patches. After the fires a sense emerged that direct action needed to be taken instead of waiting for the government to lead change. Over 400 volunteers have signed up as brigade members, participating in more than 25 interventions since April 2018. 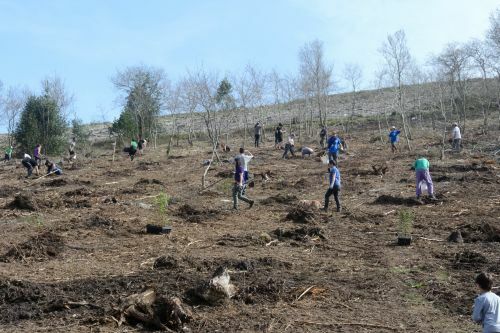 The “Brigadas” shows how people working together can bring about change in restoring landscapes and natural habitats and has transformed general pessimism regarding change into engaged participation. © 2019 Lush Spring Prize. メインの写真画像: Siliman Musse, an activist of Diritti a Sud. Photo by Allessandro Robolino.